2016 was awful. I know it was for most people, but it took me to the breaking point and back daily for months on end. By the end I told Santa that if we all survived I sure as hell better have a new spinning wheel under the tree come Dec. 25th. He did not disappoint. I’ve been eyeing a number of new wheels for years. 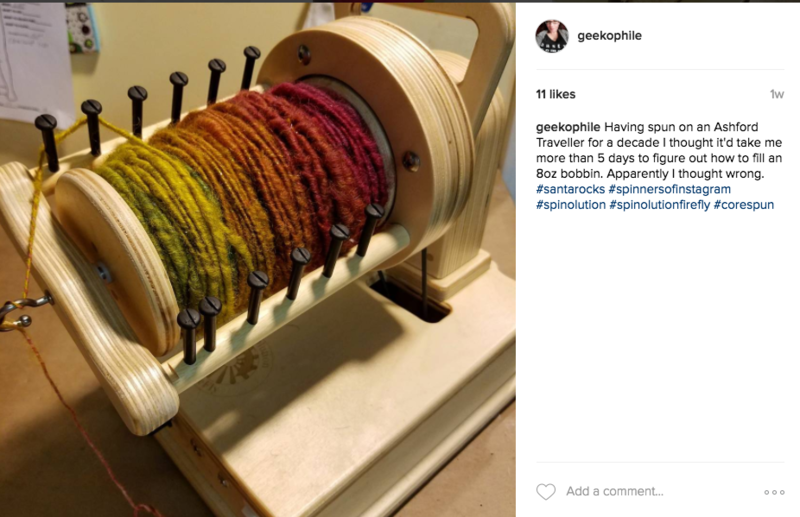 While my Traveller was (and is) a great wheel to learn on the bobbins are insanely small and it ironically does not travel well AT ALL. I wanted to play with art yarns and have the bobbin capacity to spin more than 20yds at a time. I wanted to actually take my wheel out of the house without having to take the drive band off, fold the mother of all down, and precariously strap it into the front seat. I also wanted to be more flexible in my spinning positions – I was relegated to one really old, uncomfortable, rickety chair that put me at the right height to spin without ergonomic issues. After spending about 2yrs debating various pros and cons of the Aura, Matchless, Country Spinner, and (most recently) the Device of Questionable Origin, I chose the Firefly. It was a blind leap because there are no dealers in the area; but I have come to love this wheel. It’s portable. I have both the 8oz and 32oz set up so I can spin ALL THE ART YARNS. I can spin sitting down, standing up, in the car, or laying in bed. It’s quiet. The battery charge lasts for days. I really dig the way it looks. The accessory package is very well though out. 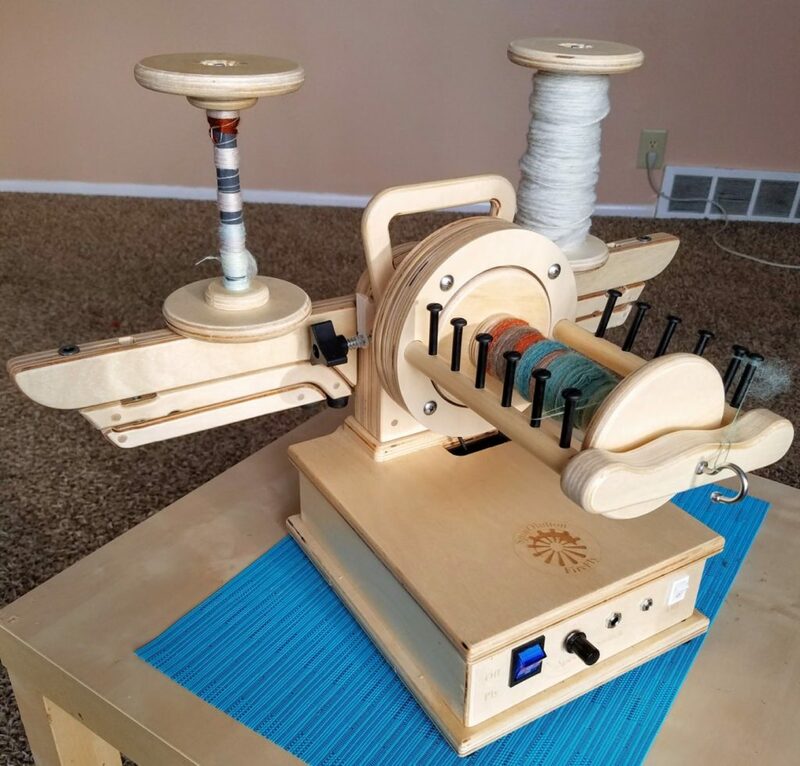 And if I ever feel the need to go back to a treadle all I need to do is purchase the Mach III body, because the skeinwinder, flyers, and bobbins fit both wheels thanks to the modular design. However it’s not an all-consuming, blind love. I quickly accepted that the wheel is not perfect and that there is a large learning curve; especially if you haven’t used an espinner before. Nothing is more humbling than realizing you aren’t the expert you once thought you were. And while I’m getting to learn the quirks; I’m still trying to find the right spot to spin laceweight silk that doesn’t result in repeatedly broken yarn and much swearing (so, so much fucks have been said). I also can’t tell you how many times I’ve accidentally had my hand or face in the way of the flyer and stepped on the foot pedal, resulting in it repeatedly smacking me while I stand there like an idiot. Because it’s a mechanical tool. Doing exactly what it was made to do. And therefore it should be treated with the same care and respect you’d give, say, a cordless drill. It’s not scary, and it’s not going to outright hurt you, but if you’re not careful you could need a bandaid or two. All in all, I’m confident that it was the right choice for me. I still urge everyone to try a wheel before buying but, just as in life, it is possible to find the right one online before meeting it/them in person.